You don't need to wait for notification about new feedback that a faculty member has submitted for you. You can start checking your feedback yourself through the Student Engagement Roster (Student) Tile in One.IU. You will also see a link in each of your courses in Canvas to check your SER feedback. Be sure to favorite the One tile so that you can always find it easily. The One.IU tile for you to view your current Student Engagement Roster feedback. The above tile will navigate to your own personal landing page for your Class Engagement feedback. 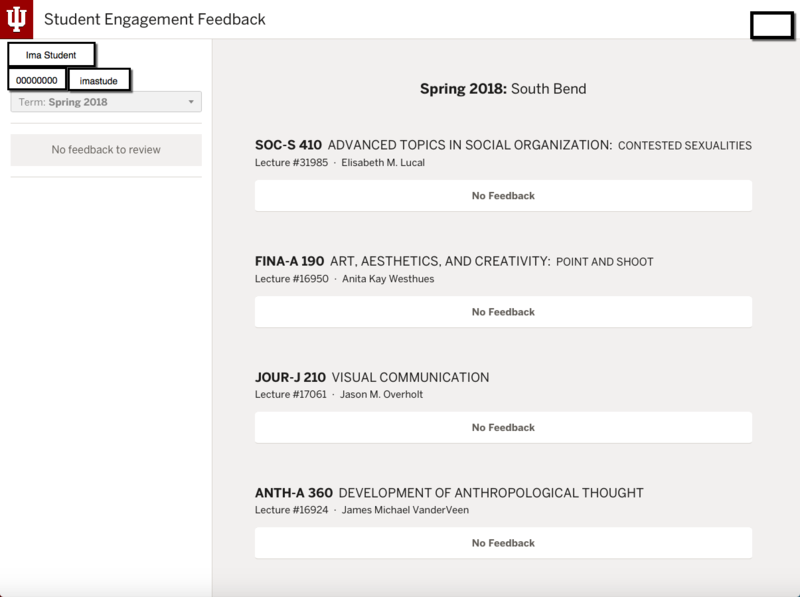 You'll be able to use this site your entire time at IU--you'll have a historical record of all feedback in all your classes. If you have any earlier feedback in a course, you can access it using the "Prior Feedback" link (which will appear where it currently says "No feedback"). If you have recommendations, they are hyperlinked to campus resources, to make it easy for you to follow the links to learn more and schedule appointments. A view of a demo version of this page is shown below.